SEOUL, SOUTH KOREA, March 18, 2019 — K-Travel Bus, a travel bus exclusively for foreigners, will run across the country from March 20. K-Travel Bus was developed by the city government in 2017 to provide international tourists with tourist attractions outside of Seoul, and to make it easier for non-Korean tourists to visit local cities in Korea. It includes reliable accommodation, selected tourist attractions and high-quality guide service. In addition to the existing two-day travel programs (Seoul & one local city), four-day and seven-day tour programs have been prepared for this year. The two-day tour consists of seven courses (Daegu, Gangwon, etc. ); four-day tour composed of two courses (East Zone: Seoul – Daegu – Gyeongbuk – Gangwon – Seoul) & West Zone: Seoul – Chugbuk – Gongju – Jeonnam – Changwon – Seoul); and the seven-day tour combines the two four-day tour programs, visiting eight cities including Seoul (Seoul – Chungbuk – Gongju – Jeonnam – Changwon – Daegu – Gyeongbuk – Gangwon – Seoul). The seven-day tour program can be joined in between to increase conveniences for foreigners living in cities outside Seoul. This year’s first official operation of the K-Travel Bus is set to begin with a ceremony to be held in front of SM Duty Free Shop located in Insa-dong on March 20. Around 60 passengers of the two-day tour program leaving Seoul for Chungbuk, Gongju and Changwon, and local government officials will participate in the ceremony. Reflecting the preferences of foreign tourists, the program features at least one specialized cultural experience program for each destination, and diversified accommodations, such as hotels, resorts and hanoks to provide an opportunity for tourists to learn and feel the culture of Korea. Each stop’s hands-on programs include making “Ttang Ttang Land” chicken and foot bath in Daegu; curling in Gangwon; making handcraft with hanji, or Korean traditional paper in Chungbuk; folk game in Jeollanam-do Province; making traditional masks and winery tour in Gyeongbuk; wearing Baekje royal costumes in Gongju; and tasting soju and wearing a hanbok, or traditional clothing, in Changwon. Prior to it, the Seoul Metropolitan Government signed a joint business agreement with seven local governments (Daegu-si, Gangwon-do, Chungcheongbuk-do, Jeollanam-do, Gyeongsangbuk-do, Gongju-si, and Changwon-si) in order to further cooperation for better operations and improvements. Seoul has been placing free hope advertisements every year since 2012 to aid the public activities of nonprofit organizations and to revitalize the economic activities of small businesses, and the first subject contest of this year will be held from March 12 (Tue) to April 12 (Fri). From 2012 to 2018, Seoul selected and provided aid to 295 organizations and businesses, and it further plans to support 40 organizations and businesses over two sessions this year. Seoul will select and give preferential treatment to those businesses that end up with the same scores in the hope advertisement subject contest for business support of youths and provide help to youth startups. Subjects of the contest include ▴contribution to society through donations, sharing, and volunteer work, and activities by nonprofit organizations that protect the human rights and interests of the socially vulnerable, ▴startup stories of small businesses that can give hope and courage to citizens and youths, and stories of public nature such as cases of social participation by corporations, etc. The selected organization will receive full support from Seoul in designing, printing, pasting, and image production, etc., and it is anticipated that the participation of youth startups with expertise in designing and image production will produce higher-quality advertisements this year. Also, in order to provide reinforced support through online advertisements starting this year, the organization or business selected for the hope advertisement will be introduced in an article in ‘Media Hub Seoul’ in addition to a separate banner that can be opened for viewing at any time. 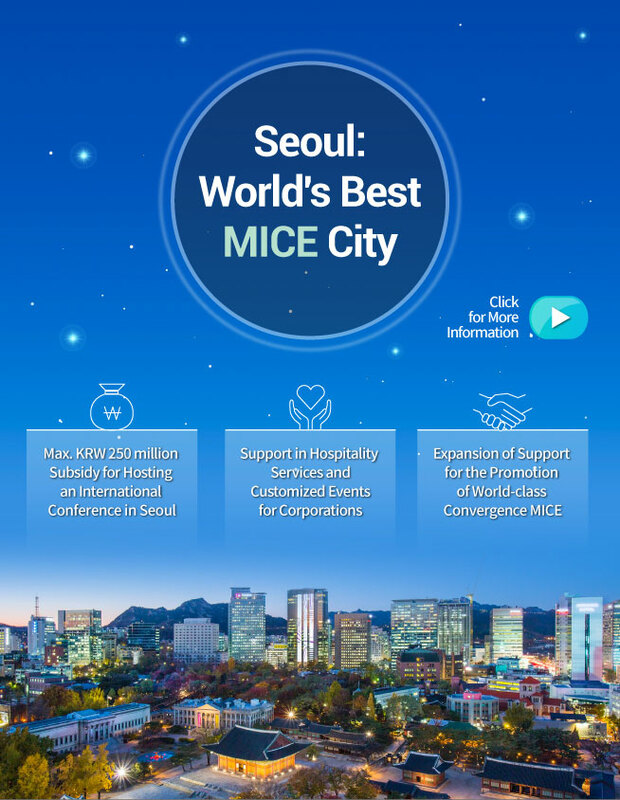 The application procedure and other detailed information can be found on Seoul City’s website http://seoul.go.kr. With continual occurrence of urban problems that go beyond the boundaries of the administrative regions of the metropolitan area to reach a megalopolitan dimension, and the need for countermeasures increasing on a wider scale, Seoul, Incheon, Gyeonggi-do, and the Ministry of Land, Infrastructure and Transport will launch a collaborative service for the establishment of Metropolitan City-Region Planning. Seoul, Incheon, and Gyeonggi-do regions form a large ‘megalopolis community (shared life zone)’ that are extremely close and connected to surrounding cities in terms of space and function. Accordingly, the need for comprehensive measures against issues such as metropolitan traffic systems, air quality improvements, and prevention of thoughtless development at a megalopolitan level have continually increased, but a practical metropolitan plan that encompasses the metropolitan area still remains absent. The Metropolitan City-Region Planning is the most significant city plan under the regulation of the National Land Planning and Utilization Act, and as a plan that presents a long-term direction for the development of megalopolitan districts under planning, it will also present reorganization of spatial structure, use of metropolitan land and facilities, and division of city functions. This Metropolitan City-Region Planning will resolve megalopolitan traffic and environmental issues in accordance with the reorganization period of the Fifth Comprehensive National Development Plan (’20-’40) and the Fourth Seoul Metropolitan Area Readjustment Planning (’21-’40), while stressing the establishment of a practical plan for metropolitan development appropriate for such time of population decrease and low growth. The proposal for the 2040 Metropolitan City-Region Planning will be drafted early next year, and the final plan will be confirmed late next year after deliberation by the Central Urban Planning Committee. This year marks the 20th year since Seoul founded a national unit organization in relation to informatization for the official launch of an ICT-based city management and operations policy. Seoul plans to rise above its overwhelming status for seven consecutive years as number one in e-Governance in the world, and kick into high gear to attain the goal of cutting-edge ‘Smart City Seoul’ based on big data and new ICT. At the core of Smart City Seoul is big data known as the ‘crude oil of the 21st century.’ Continuing Seoul’s individual services that operated under the name of ‘informatization’ such as the Owl Buses, public Wi-Fi, and mVoting, Seoul will combine the IoT, blockchain, and other key technologies of the Fourth Industrial Revolution to the world’s best ICT technology, infrastructure, and accumulated city and administrative data which have been constructed until now, in order to create a new growth engine and offer new services as never before experienced in the past. For this project, 50,000 ‘IoT (Internet of Things) sensors’ will be installed throughout Seoul. In the area of transportation, the ‘Shared Parking System’ will be introduced within the year to relieve chronic parking difficulties with the IoT sensor that will grasp the availability of parked cars in real time, allowing citizens to check, reserve, and pay for parking spaces via a smartphone app. The sensors will analyze floating population data even when installing senior welfare centers and other infrastructure in order to expand infrastructure to areas of demand. When establishing city plans or constructing new buildings, the ‘3D-based Virtual Seoul’ system will simulate how these will affect the existing city environment and upgrade city management policies. Also, 120 Dasan Call Center will apply a trial run of the ‘Chat Bot’ function, which automatically responds to citizens’ questions using the artificial intelligence (AI) technology, and images will be analyzed based on big data and AI technology to officially introduce ‘Intelligent CCTV’ that automatically detects particular situations like fights and fires.